Me: sitting in Bryant Park, eating a Caesar salad from Mrs. Lovett's (tastes like real Caesar! ), watching t-shirt clad ice skaters navigate the melty ice in 63-degree January heat (thank you again, Al Gore, for inventing global warming! ), singing the Peter part of Peter, Paul, and Mary's "Lemon Tree," and rubbing a small, plush Lollipop the Bear action figure (yeah, I said plush action figure, what) complete with eco-friendly mini-machine gun and its own Vespa Scooter with a skull and crossbones emblazoned on the side. I love you, potato. Don't play hard-to-get. Don't play your starchy tuber games with my heart. Come, and let's dance in the afternoon drizzle and eat bonbons and go see your apartment on the Upper West Side. And damn you for making this into a missed connection from craigslist. P.S. I bet you thought I was going to comment on Hillary beating down the black man in New Iowa yesternight, didn't you? Nope. I ain't got nothing to say on the subject. This is like the early goings of a game of Hollywood Squares, when the contestants are still feeling each other out, and when Whoopi Goldberg in the center square is still totally up-for-grabs. P.P.S. Speaking of which, Whoopi = black AND a woman!! Is that not the dream hybrid Democratic candidate!?!? CLINTOBAMA! CLINTOBAMA! REPUBLICANS SHALL WILT BEFORE THEE! HALLELUJAH! QUICK, someone get me some Tylenol - my brain hurts from all the good ideas. And get me a potato too, because I'm lonely. P.P.P.S. Whoever did it, by the way, thanks for the shoutout in the 181st Street subway station yesterday. 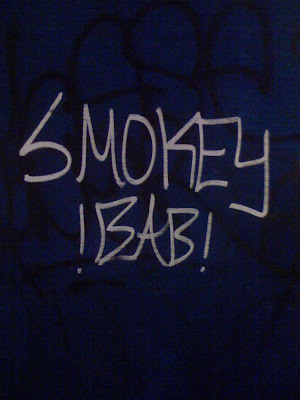 I assume "BAB" is short for "BABE" or "BABY," or that perhaps that's as far as you got before the cops got there with their cold, hard anti-expressive handcuffs. I'll take Graffiti FOR THE WIN! And a potato, to keep me company during the lonely nights! You may be 1 of only 4 people that I can sit down, read multiple posts straight through, consistently laugh and not end up hating you at the end of said experience. thank you for that. I think my friend crescenet summed it up best with his comment on your last post..."this post is likeable"
I heard that Mrs. Lovett's Fruit Pies danced on the tongue. Thanks for the love. I adore the massive amounts of pubescent 80s nostalgia on your site too. Tell crescenet I said I would shortly like to imagine him. You ain't lyin'. And the Smokey Robinson had a pleasant, citrus flavor with delcious notes of blackcurrant! Bon apetit!